Captain Amos January, and crew, are forced to look for ship repair materials on an unknown planet. There they discover an alien ship filled with fascinating artifacts, among them a shape-changing sculpture that becomes known as “The Dancer.” We learn of some of The Dancer’s attributes as known in ancient legends and confirmation is received as we watch the story unfold. It is sought by cabals, pirates, governments, and other powers who unleash different characters to acquire The Dancer. Not unexpectedly these characters are scoundrels, idealists, and romantics whose tracks intersect and form their own sort of dance as they maneuver to best one another. This tale is told to us as a story within a story as a Harper hears the tale, a bit at a time, from the Scarred Man. This is an interesting device as not only are we told the story but Flynn uses the framing story to give us his ideas about storytelling as an art. Stefan Rudnicki narrates with his usual expertise, adroitly affecting slight voice changes that communicate character when voicing dialogue. One wishes that the editors had added a slight aural indicator when there were scene changes. In a book of many characters who are flung from one exotic location to another at a second’s notice, it is very difficult to tell when there is a scene change immediately with nothing other than a slight pause between sections. I must also note, that my above complains about Flynn’s book overall may have been due to the fact that a complex book is necessarily more difficult to grasp when listening rather than reading as it was written. In this instance, the editors would have done well to help the listener all they could. If you are a Michael Flynn fan, this book will not be a complete waste. I did enjoy it initially, but I simply wished it had been truly the space opera that it purported to be. Note: should readers think that there are no modern writers capable of space opera that is worthy of comparison with those of older times, I refer you to the “Agent of Change” series by Sharon Lee and Steve Miller (Agent of Change, Conflict of Honors, Carpe Diem, Plan B, and I Dare) and Space Vulture by Gary K. Wolf and John J. Myers. None of these are in audiobook format that I know of but are well worth seeking out. Season Four of Robotz of the Company Coming Soon! Fall is the time of year for season premieres, and Dream Realm is no exception in that department. Their flagship series Robotz of the Company is about to begin its 4th season of zanyness! It will kick off at the end of October with their Halloween special Night of the Living Gunk– and you don’t want to miss it! 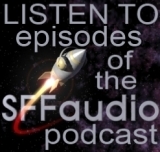 They also have two promos for ya- so you podcasters and radio folk download these links and spread the bot-word on your shows! 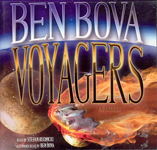 Voyagers is a superior first contact novel. It was originally published in 1981, but it holds up extremely well, especially since our space program has not changed all that much in the past 26 years. But the novel’s setting is the now that was then, which means the United States and USSR are the two superpowers and the only two countries with space programs. The book starts off in a similar way to Clarke’s Rendezvous With Rama. An alien craft has been detected, and it’s in the solar system. Those in the know have no clue what the ship wants – are the aliens hostile or friendly? What does this mean for humanity? From there the story takes a tack similar to another Clarke novel – 2010: Odyssey Two, but Clarke’s book was published a year after Bova’s. The United States and the USSR decide to cooperate rather than fight. The underlings (i.e. the folks doing the actual work) are ready and willing to do so, but the politicians spend their time pulling the other way. Other internal arguments include everything from “when should we tell the public” to “who gets to go”. Throughout the novel, Bova takes the time to look around at the world’s reaction as they are informed. Rumors fly and some factions of humanity take action based on those rumors. In short, Bova gives us a fascinating and plausible account of the world’s reaction to first contact. Widespread panic? Don’t think so. All of this builds up to a truly powerful conclusion. 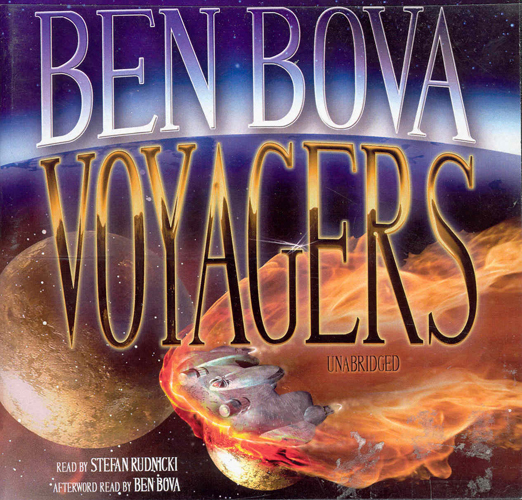 The final two CDs of this audiobook contain the most affecting first contact narrative I’ve ever heard or read. I couldn’t help but to play them both again immediately upon finishing, and I’ve resolved myself to keeping them on my iPod indefinitely so that I’m sure to have them with me next time I find myself in a quiet moment under a starry sky. Stefan Rudnicki continues to impress with this narration, in which he performs many different voices with many different accents, all effective. Though Bova’s story is Clarke-like, there is much more to work with in the character department than in Clarke’s stories, and this allows Rudnicki the opportunity to shine. Also effective in the audiobook are the chapter breaks, each of which is read by a different narrator and each of which contain thought-provoking stuff, from quotes of real-life scientists to news stories that are part of the fiction. I greatly appreciate this kind of thing in an audiobook because it provides a true break as effective as a new chapter in text. All too often, audiobooks don’t create this break for the listener, resulting in a few moments of disorientation as the listener mentally moves to a new setting and/or POV. No such problem here – the prominent breaks are much appreciated. A new LibriVox title has piqued our interest. It’s Marion Zimmer Bradley’s 1963 novel The Colors Of Space. Sadly, this is not the ideal audio version of it as it has multiple readers – who seem to have randomly chosen their chapters. I think the ethos of LibriVox is absolutely wonderful, but the output, especially in cases like this seems more geared towards project completion and narrator convenience rather than listener preference. That said, the audiobook is 100% free and very easily downloadable either by a Zipped Folder full of MP3s, singly in individual file of MP3 or OGG Vorbis formats and by the podcast feed (including a one click iTunes subscription). Bart Steele, a Space Academy graduate, has the potential to gain the secret of an alien “warp drive”, a super-fast technology for interstellar travel. He’ll have to get some surgery, and spy upon an alien race to do it but he’s . lucky because by a bit of genetic quirk Bart can see a wider optical range than ordinary humans. Still, countless human spies have already failed to gain the secret. Both shows are written by Matt Wallace, the Parsec Award-winning writer and creator of The Failed Cities Monologues which first podcast through Variant Frequencies. The cast is, as always, made up of the talented actors and actresses from the Decoder Ring Theatre stable. And in two week’s you’ll be able to hear the second adventure “Deck Gibson And The Last Squadron Fighter”!